Potatoes should be planted so that when they emerge from the soil, the danger of frost has passed. It is a temptation to plant potatoes too early in the hope that they will raise an early crop but frost is a major enemy of emerging potato plants and will cause them significant damage. If you have chitted / sprouted your potato sets then they should be planted around the fourth week of March 2017 in average areas of the UK. 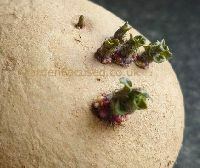 See our page on chitting / sprouting potatoes here. Plant your potato sets a week earlier if they have not been chitted. When gardeners have chitted their potato sets they often ask how long should the sprouts be when the potatoes are ready to plant. This is in fact the wrong question to ask. The question to ask is when should chitted potatoes be planted. The answer is given in the paragraph above. The ideal length of the sprouts is somewhere between 1cm and 3cm long but the correct planting time is far more important however long or short the sprouts are. When you have planted the potatoes, the sprouts will slowly grow to the surface of the soil and then appear as small stems. Any frost at this stage will kill off the surface foliage giving the potatoes a severe check to their growth. Use the date adjustment feature of this website (click here) but also take note of when other experienced gardeners plant potatoes in your area. They will have several years experience of the climate in your location and will know exactly when to plant seed potatoes. Potatoes can be raised earlier in the year using several methods including growing them under horticultural fleece until a week after the last frost date. Probably the easiest method is to raise early varieties in individual pots either in a greenhouse or under cloches. If you do this, start the chitting process off two weeks earlier than normal and pot them up into individual pots also two weeks earlier than you would normally plant the sprouted seed potatoes. Use largish pots, at least 20cm / 8in wide. Place the potted potato plants out in the greenhouse or in a sheltered position under cloches. Plant the new potato plants in the open ground about the first week of May 2017 in average areas of the UK (one week after your last frost date). The whole crop of new potatoes can be cultivated in this way but it is probably best to grow only half this way and the other half in the normal fashion. This will spread out the cropping season giving you new potatoes over a longer period. One of the commonest questions we are asked is should all types of potatoes (maincrop, second earlies and first earlies) be planted at the same time? The answer is an absolutely yes! The difference between the types is not when they should be planted but how long they take from planting to harvest. We cannot stress too strongly that ALL seed potatoes should be planted so that they emerge above the soil surface when the chance of frost has passed. Frost damages potato foliage and adversely affects the harvest date. Potatoes give of their best when planted in a sunny position, this allows them to get off to a good start. They will tolerate most soil conditions but do best in a well dug slightly acidic soil. Certainly, do not apply lime to the soil if you plan to grow potatoes. Add well rotted compost the previous winter before planting if you have any and apply a good amount of a long-lasting fertiliser such as blood, fish and bone at planting time. Potatoes are one of those plants which need a new site each year. Basically, only plant potatoes on a site which previously contained potatoes after three years. If you do plant on the same site each year, the soil will very quickly become diseased and your potatoes will suffer. It will also take a long time to rid the soil of those diseases. Other plants in the same crop rotation group as potatoes include tomatoes and aubergines. So, if you plant potatoes, tomatoes and aubergines in plot one of your garden, do not plant them in plot one again for three years. Planting potatoes is relatively simple as long as you follow the rules for spacing them out. Dig out a furrow which is 10cm (4in) deep and as long as you require. You are digging the furrow because it's not a good idea to simply force the seed potatoes into the ground. If you force them into the soil, the sprouts are liable to be knocked off and the potatoes may also be bruised. Space individual seed potatoes about 30cm (12in) apart for early potatoes and 37cm (15in) apart for all other potato types. If you are planting more than one row then space the rows 60cm (24in) apart for early potatoes and 75cm (30in) apart for all other varieties of potatoes. 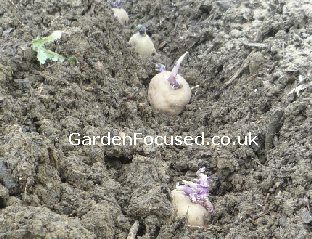 When you place the seed potatoes in the furrow try to have as many of the sprouts pointing upwards as possible. Gently cover them with soil trying not to damage the sprouts. It's worth while reading the comments we make, in our potato care page, about earthing potatoes and the problems you can encounter depending on the distance apart between rows - see here. Some gardeners earth (see here for an explanation of earthing up) up their potatoes as soon as they are planted but this does no good. 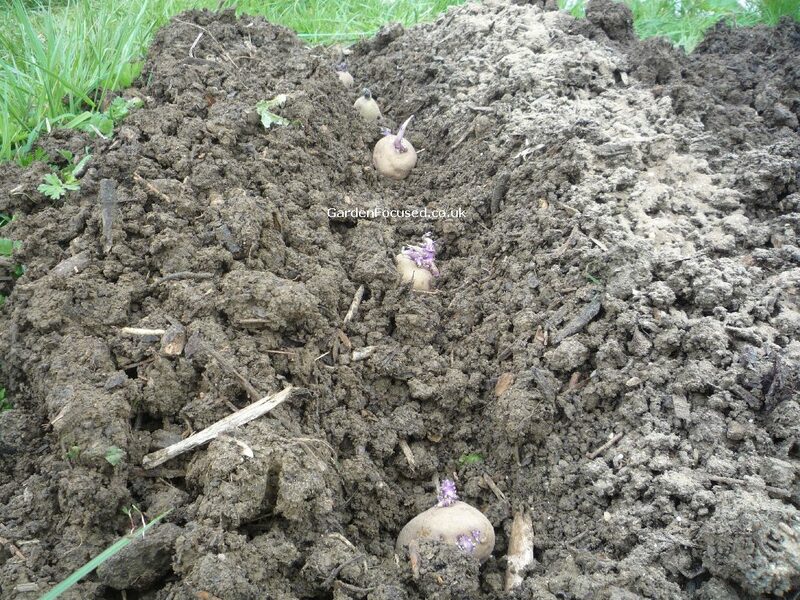 The potatoes will still start to form near the surface of the soil negating the effect of earthing up. Potatoes have been grown for thousands of years and during that time lots of true and some not so true lore has been built up around planting potatoes. We give our view on the three most popular assumptions. Let's knock this one on the head right away. Planting potatoes does not clean up the soil, in fact potatoes can introduce lots of disease into soil. See the paragraph entitled Potatoes and Crop Rotation above. 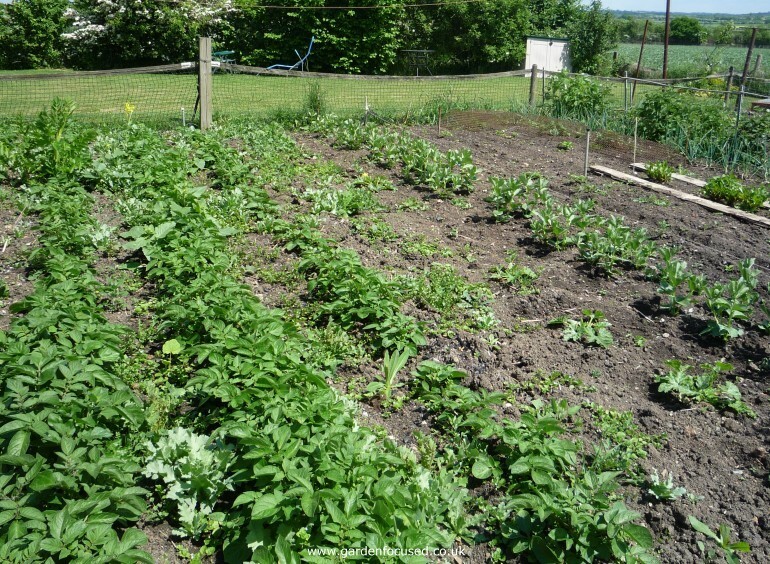 Planting and cultivating potatoes does however result in relatively weed free soil. But that is mainly because the original planting and subsequent earthing up activities involve lots of soil cultivation. You are the one who is removing the weeds, not the potatoes! Once every six or seven years you will find that the last frost of the year will be late and catch you out. Frost damages potato plants. For example, if you live in the West Midlands the last frost of the season is normally early to mid May. But in 2010 the last frost was two weeks after that. Twelve or so years ago, a frost hit our allotments in the West Midlands in early summer. Given the above, some gardeners may advise (though not necessarily follow their own advice) planting potatoes later in the season than the average last frost date. Occasionally this will be a good move but for six out of seven years you will be planting your potatoes later than needed. We believe that it's best to be caught out every seven years or so rather than plant potatoes later than needed six out of every seven years. Some gardeners maintain that potatoes can be planted on ground which has weeds in it. Their theory is that potato plants grow faster than weeds and the potato plants will soon smother the weeds. Not a good idea really and it all depends on the type of weed, the variety of potato and the ground conditions. Potatoes are food hungry plants and weeds take nutrients from the soil to the detriment of growing potatoes. But one thing is definitely true about potatoes and weeds, potato plants will outgrow and smother weeds quicker than almost all other vegetables. If time is at a premium, then leave weeding the potato patch until last. Potatoes will withstand weed competition better than many other plants. The picture on the right shows our neighbour's allotment in late spring. He has been on holiday for two weeks and will not return for another week. Before he went on holiday he only had time to weed part of the allotment. As you can see, he has left the potatoes to compete with the weeds on their own but he has thoroughly weeded other parts of the allotment. A wise move given the time he had available for weeding. A thorough weeding of the potato patch when he returns will ensure that no lasting damage is done to his potatoes.